It’s a big weekend of racing – four Ironman events around the world with the final qualifying slots for the 2016 Ironman World Championships. First up is Ironman Sweden, which took place yesterday. 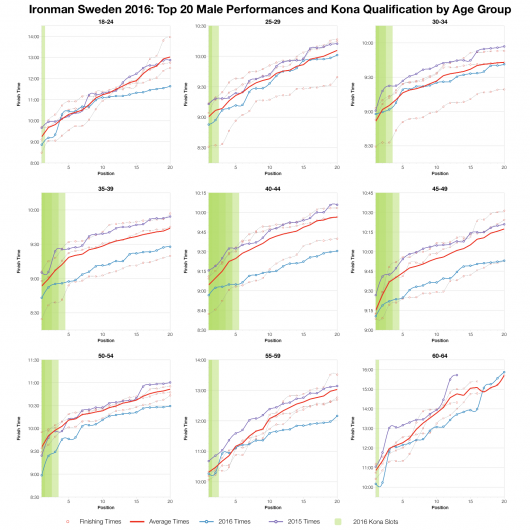 It’s a race that has produced some exceptional age group times and this year doesn’t disappoint: qualifying times for the 40 Kona slots on offer were fast by any standard. 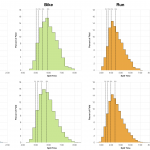 First up a comparison of split distributions between this year’s race and the previous four years. The swim and the bike clearly trend faster, but the run doesn’t diverge by much. With two stages faster, the overall results naturally follow and the 2016 race comes out ahead of the course average. 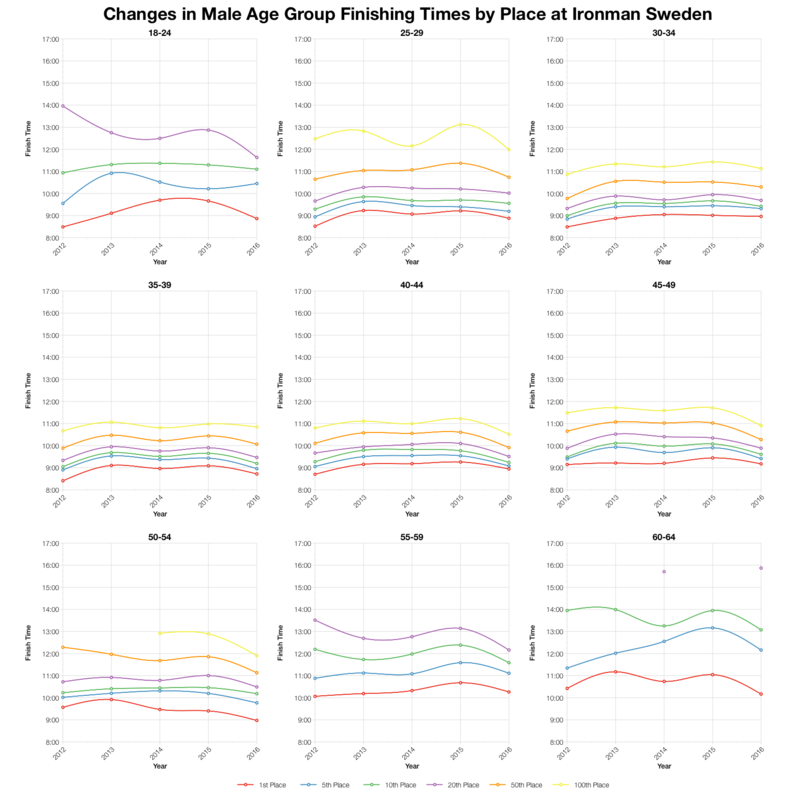 Sweden has always been a fast course, this year is not exception. Ironman Sweden is one of the larger European races with over 2,000 athletes making the start line. The overall DNF/DNS rate at this year’s event falls in line with previous years, but there’s a noticeably lower DNF rate on the bike. Given the faster than usual bike splits this would suggest conditions were particularly favourable on the bike. 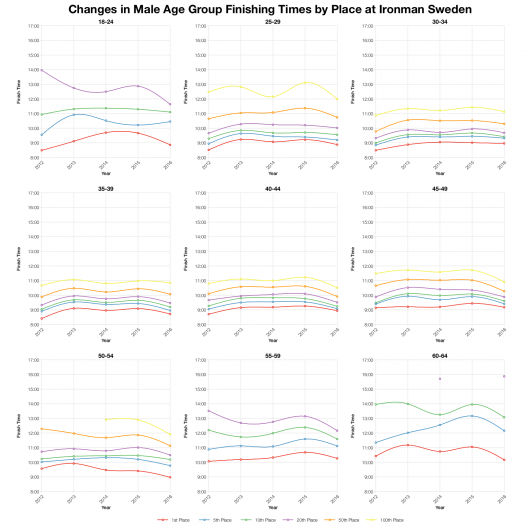 Breaking down the splits into age group medians confirms that this year trended faster. 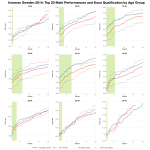 Both swim and bike median splits are consistently faster across the age groups. 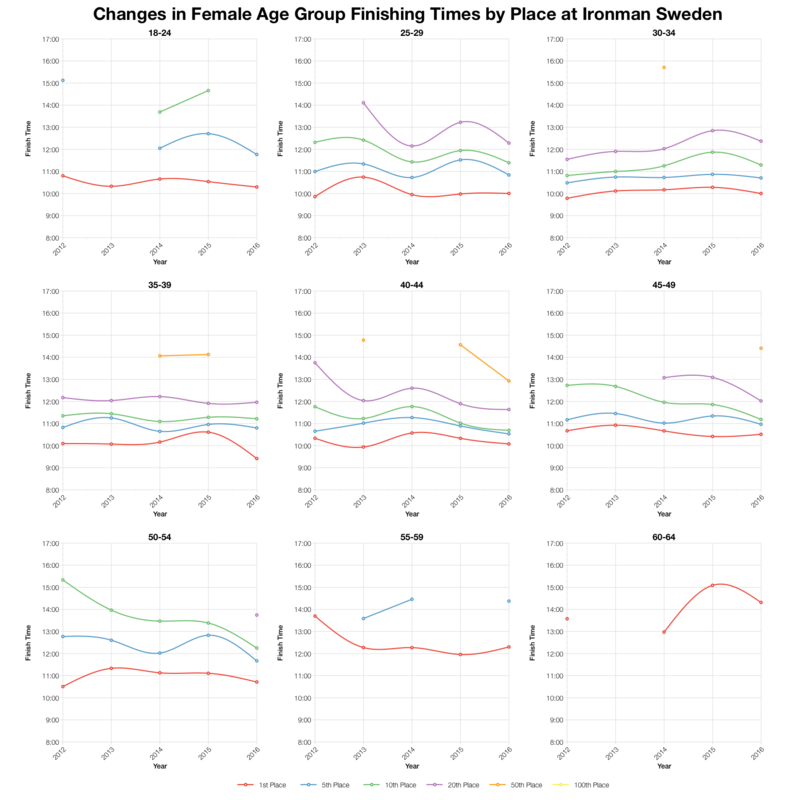 The pattern is less defined for the run, but the run also trends faster for a number of age groups. As we’d expect the majority of athletes are Swedish, but there’s a strong British contingent and a spread of other nationalities also on the course. Ironman Sweden debuted in 2012 with an exceptionally fast race. It’s never matched that opening year, but 2016 looks to be the closest it’s come to repeating those times. 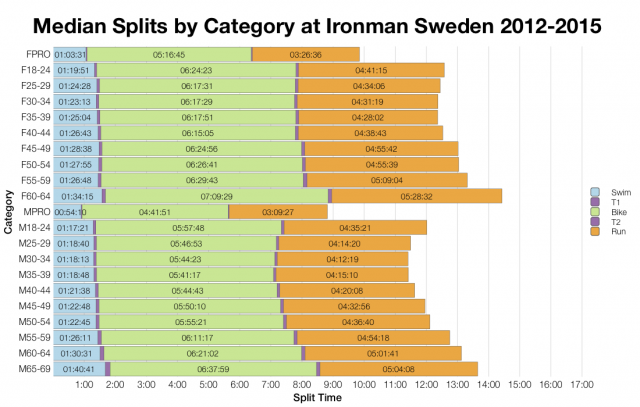 There aren’t huge variations; even at its slowest Sweden is one of the fastest Ironman courses. 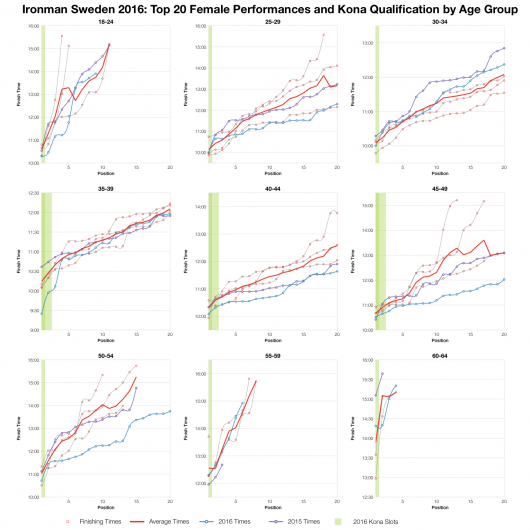 Based on the athlete tracker I can calculate the allocation of Kona slots and from that the automatic qualification times at this year’s race (as ever, actual numbers will depend on exact start numbers). If more proof was needed that Sweden was fast you just have to look at all the sub-9 hour qualifying times in the male age groups. If you’re under 45 and male, you needed to be finishing around the 9 hour mark to have any chance! For women 10 hours provided a similar standard. 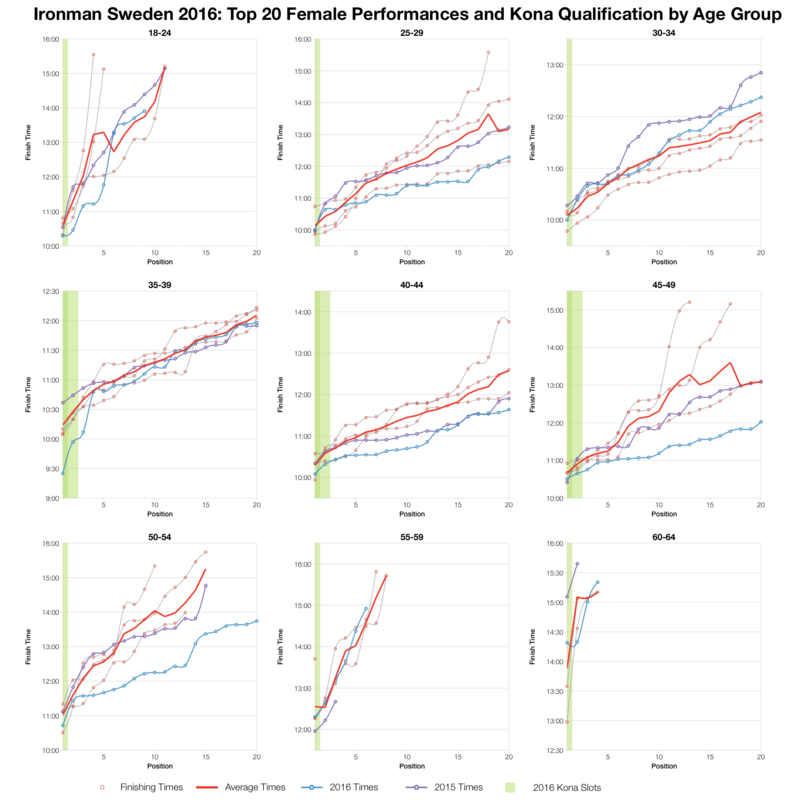 You can compare these numbers with other races on my Kona qualification page. 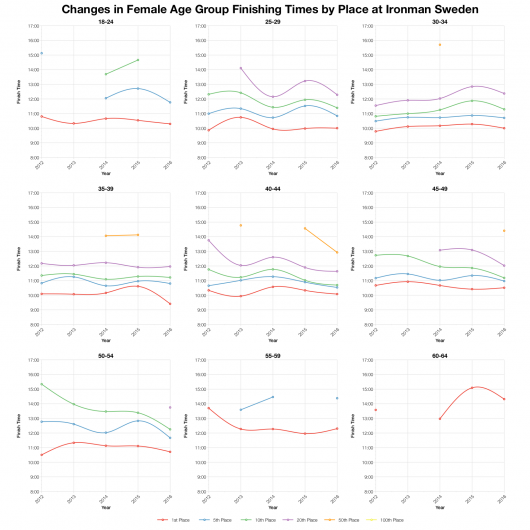 Between the ages of 35 and 50 for men (and to a lesser extent women) top twenty times fall ahead of the course averages and closer to the course records. As we saw in the previous table, these age groups were fast. Most other divisions were closer to the course averages, but that’s still fast. There was clearly a strong front of pack contingent at this year’s race, making for a competitive field. 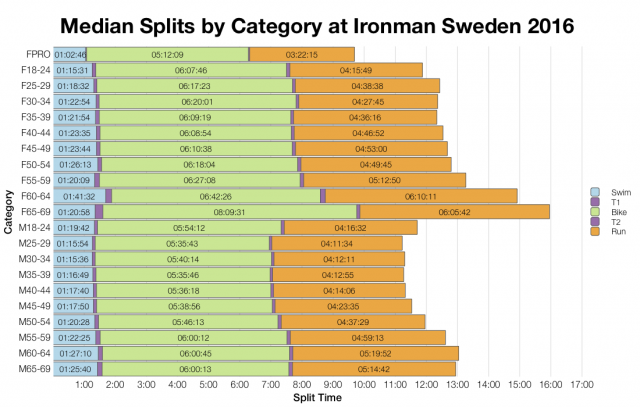 Sweden remains a really good choice for a fast Ironman time. As a qualifier it’s more challenging. Required times to be confident of a slot are exceptional, up there with the fastest courses on the circuit. 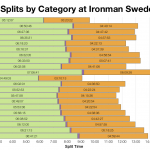 You can access a spreadsheet of the full results and splits from Ironman Sweden 2016 on my Google Drive.